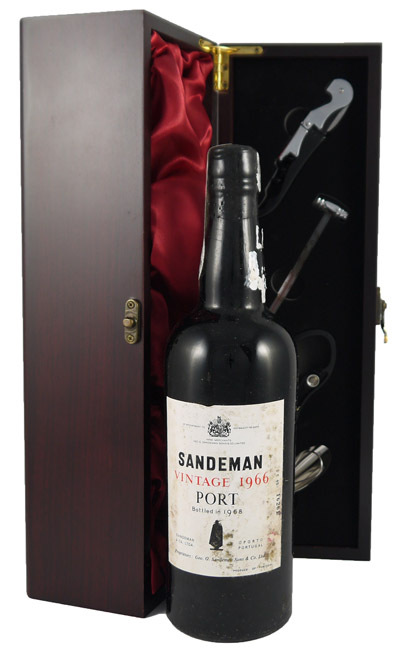 From the marvellous 1966 vintage, this Sandeman port has a sweet nose with vanilla and liquorice flavours and a lean elegant balance with a hot dry finish. Drink now - 2023. An outstanding Vintage Port year producing Vintage Ports with superb structure, filled with fruit and tannins. James Symington of the Symington Port Group, "Musts everywhere showed higher than average readings and the colour is excellent. Yields on the other hand are the lowest for many years, some Quintas being as much as 30% down on their '64/5 productions.We are delighted with the prospects for the 1966's. It will be surprising indeed if 1966 does not prove to be an excellent vintage for Port."